In the early 1950s, Richard Todd was halfway through a seven-year contract with Associated British Pictures when its director of productions, Robert Clark, bought the film rights to Paul Brickhill’s book The Dam Busters. Todd was already an established star, having received an Oscar nomination for The Hasty Heart in 1949, and playing Robin Hood in the Walt Disney movie of the same name. Clark wanted a vehicle for Todd, and the physical resemblance between Todd and the character he was chosen to play, Wg Cdr Guy Gibson, obviously helped him in the choice. Most of the obituaries (Telegraph BBC) single out Todd’s part in The Dam Busters as the highlight of his career, and he certainly took great pride in being remembered for the role, regularly turning up for reunions, other events and signings. It was, as American critics of the time pointed out, his ‘characteristic British understatement’ which made his portrayal of Gibson so memorable. His own war experiences must have contributed to his decision to play his ‘war’ roles in such a way – he was determined never to demean or trivialise the memory of the actual war and its casualties. The film is over-long (the flying sequences include some repetition) and the music score is, regrettably, very blatant; but despite these drawbacks, a mood of sober respect is maintained. Little did the reviewer know how popular the ‘blatant’ musical score would become. My favourite piece of Dam Busters trivia derives from the scene shown above, showing on the left the great Robert Shaw, later to star in no less a movie than Jaws, where he ends up meeting a spectacularly gory end. 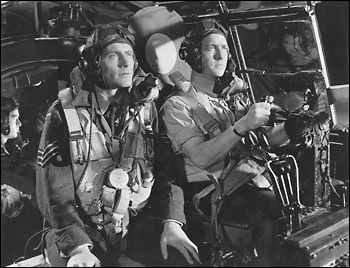 Here he plays flight engineer Sergeant John Pulford, which means he gets to sit alongside Richard Todd, playing Guy Gibson, for a large section of the film but has very few words to say. Their on-screen interaction is thought to be a pretty accurate reflection of the real life relationship between Pulford and Gibson. Filming The Dam Busters in Skeggie – bracing enough? Fascinating account of a day’s filming, sometime in early 1954, on location in bracing Skegness for the famous scene in The Dam Busters where Barnes Wallis watches his mine being dropped for the first time. The article, written by a junior reporter, was published in the Skegness Standard, and the journalist himself writes an afterword, telling how he got an exclusive interview with Richard Todd who drove him back to the town. No luxury trailers or personal drivers in those days!